Dr. Lynch graduated from the University of Georgia in 1968. Shortly thereafter, in April of 1970 he purchased Jacksonville Veterinary Hospital on Sweet Air Road, in Phoenix, MD. In 2004, the practice was moved to its present location on Jarrettsville Pike. Dr. Lynch is well known in this community.His kind and gentle manner has served pets and people for more than 45 years. Dogs, cats, rabbits and pocket-pets have all found comfort in his caring hands. He enjoys spending time with his wife and family, music, gardening, splitting wood, and being outdoors. Dr. Burk has been with Jacksonville Vet since 1995 and has a dedicated and loyal following who appreciate her meticulous attention to detail and her caring and kind touch. Dr. Burk graduated from the Virginia-Maryland Regional College of Veterinary Medicine in 1994 and also holds a BA in Animal Science and a Degree with Distinction in Immunology. Dr. Burk is married and has two children who share her love of animals. She enjoys spending time with her family, outdoor activities like hiking and running as well as gardening and cooking. Since she joined Jacksonville Veterinary Hospital in 2002, Dr. Thai's warmth and cheerful demeanor, combined with her expertise, have made her invaluable to the practice. Dr. Thai is a native of Maryland and grew up in Gaithersburg. She received her degree in veterinary medicine from Virginia Maryland Regional College of Veterinary Medicine in Blacksburg, VA in 2001. Dr. Thai likes spending time with her husband and children, and loves being by the water. Pictured with Melissa is one of her kittens, Cinnamon. Dr. Kablis graduated from Virginia-Maryland regional College of Veterinary Medicine in 2005 and has since been practicing small animal medicine in Maryland. She joined our staff in 2014 and enjoys caring for dogs, cats, rabbits, ferrets, guinea pigs and other pocket pets. When Dr. Kablis is not treating animals, she enjoys spending time with her husband, their two little girls and their Golden Retriever, Maple. They enjoy outdoor activities like hiking and camping. Dr. Kablis also loves all things Disney, and scrapbooking when her busy schedule allows. Dr. Miller grew up in White Hall, MD and started working in the kennels here at JVH during high school and college breaks. Jenny completed her veterinary degree at Virginia – Maryland Regional College of Veterinary Medicine and has a BS in Dairy Science from Delaware Valley College. After more than two years practicing in the Hagerstown area she is happy to be returning to Jacksonville Veterinary Hospital. In her spare time Jenny enjoys being with her family and friends, working with dairy cows, and spending time with her Cavalier King Charles Spaniel named Stanley (pictured). Dr.Larsson was born in Sweden and came to the United States with her family at a young age. She graduated with her doctorate in veterinary medicine from Oklahoma State University in 2015 and started with our practice in 2017. She regularly sees appointments Monday through Saturday, performs surgeries on Wednesdays and specializes in holistic medication, herbal remedies and acupuncture. We are so excited to be able to offer our clients a new treatment option! Dr. Larsson is pictured here with her pet, Zoey. Zoey has been benefitting greatly from acupuncture treatment for incontinence and arthritis. Holly started her career as a veterinary technician in 2003 and first joined the JVH team in 2008. After earning her B.S. in Biology in 2013, she left JVH to pursue an opportunity at the National Aquarium. She worked full time caring for the animals in both the Rainforest and Australian exhibits, and taught the public about the importance of biodiversity and conservation. In January of 2014, she was invited to join JVH as the Hospital's new Practice Manager. In her spare time, she enjoys spending time with her family, hiking, kayaking, photography, and snowboarding. Pictured with Holly are her dogs Roxy, a Siberian Husky, and Jager, a lab mix. Andy started as a volunteer in 2010 and quickly transitioned into a veterinary technician. Andy earned a B.S. in Biology with emphasis on Pre-veterinary Medicine from Towson University in 2014 and is currently studying to become a veterinarian at the University of Georgia. In his spare time, Andy enjoys working out, watching Netflix, cooking and baking. Pictured with Andy is Erin’s dog, Toby! Erin has been a part of our team since 2010. She studied Biology in College and now works to give each patient the individualized care that they need. As one of our team's veterinary technicians, she uses her interpersonal skills to give each pet's family comfort during their visit to our hospital. When she is away from the office, Erin enjoys spending time with her family and her dogs. Pictured with Erin is one of our patients, Wyatt. Alanna started as a veterinary technician with our hospital in 2016 after gaining one year of experience at a local small animal hospital. She is currently working towards her Bachelor's degree at Towson University and plans on pursuing a career in animal medicine. Alanna enjoys getting to meet our clients and their furry loved ones. Outside of work, she loves traveling and spending time with friends and family, including her orange tabby, Simon, and her Pekingese puppy, Pepe. Pictured with Alanna is one of our employee's foster puppies. Jess has been with our practice since 2013. She started as an animal caretaker and has worked as a receptionist. She graduated from the University of Baltimore in 2013 with a degree in Business Administration. She is now enrolled in the Penn Foster program to become a veterinary technician and has been training to provide a high standard of care to our patients. Outside of work, Jess enjoys art, spending time with her pets, family and friends. Dominic is currently a pre-veterinary student in his senior year at Towson University. He started volunteering for an equine veterinarian in 2015 and was referred to our practice to gain additional skills with small animals.Dominic has been a vet tech with us since 2015 and was recently accepted to Vet school! He is currently taking courses at St. George's University in the West Indies. In his spare time, Dominic enjoys playing and coaching lacrosse and spending time with friends and family. Laura has been with us since 2006 and is a familiar face to most of our clients when they greet us at the front desk. She knows most of our clients and their pets by name. In her spare time, she enjoys hiking and kayaking with her dogs and her husband, taking the Polar Bear Plunge each year for charity, and watching the Ravens games during football season. Pictured with Laura is her rescued Pit Bull, Lugnut. Mary joined our receptionist team in 2013 after working in the veterinary field for over two decades. She earned a B.S. in Animal Science from the University of Maryland in 1985 and has a strong interest in animal behavior and training. Mary is an excellent educator and demonstrates empathy and compassion with the animals and their family members here in our hospital, as well as in her spare time. Mary helps abandoned animals in her spare time, and is also very involved in AKC obedience, training, tracking, protection, and cares for a variety of animals on her farm. Pictured with Mary is her Doberman Pinscher, Hottie. Rita joined our receptionist team in 2012 after gaining her experience in the equine veterinary field as a surgery technician for 25 years. She has rescued and rehabilitated race horses and found them loving homes. Having rescued three dogs, Rita knows how important pets are to their families. Here at JVH, she is a friendly face to each client and pet as they enter our hospitl, and helps ensure that each visit runs smoothly and efficiently. When Rita is away from work, she enjoys gardening, riding her horse, "Indio", and has fox hunted and played polo with her husband. Pictured with Rita is her miniature schnauzer mix, Zenyatta. Tina joined the JVH team in August of 2016 as one of the front desk receptionists, to which she brings a lot of positive energy. She has 5 children, 6 grandchildren, and three dogs. Pictured with Tina are two of her rescued dogs, Olive and Sydney who live with her and her husband, Bryan. Her background is in pharmacy technology and early childhood development. She is looking forward to furthering her education in our veterinary practice. In her down time, Tina helps out with the House of Hope Dog Rescue, loves camping, and spending time with friends and family. Jen started her journey with Jacksonville Veterinary Hospital as a receptionist and veterinary assistant in 1993 upon graduating high school. She volunteers with rescue organizations taking in orphaned newborn kittens. Jen has four daughters and a menagerie of animals, including dogs, cats, horses, cows, rabbits, guinea pigs, chickens, geckos, and an axolotl. In her spare time, she enjoys spending time with her family and pets, photography, crafting, hiking, camping and cooking. Jen is pictured with her dog, Daisy. Sarah started as a volunteer in 2018 and has quickly become part of our team as an animal caretaker. She graduated with her B.S. in Biology with a focus on Chemistry from King's College in Wilkes-Barre, PA and is currently enrolled in the Penn Foster Veterinary Technician program. In her spare time, Sarah enjoys ballet, playing lacrosse, running and playing with her three cats, Leon, Onyx, and Halo. Lily has been a member of our animal care team since early 2018 and loves spending her time playing with our boarding pets. She is currently studying to be a nurse at Harford Community College. In her free time, Lily enjoys spending time outdoors, going to the beach, and playing with her adorable 18 month old Newfoundland named Ivy. Ryan graduated from Calvert High School in 2016 and is continuing his studies at Towson University. Ryan has been a trusted member of our staff since 2017, and he loves taking care of and interacting with your pets! In his free time, Ryan enjoys snowboarding, soccer, and spending time with his 3 year old German Shorthaired Pointer, Daisy. Brady is a senior at Calvert High School and joined our team in September of 2018. He has a passion for baseball and watching professional sports. Brady enjoys being around the animals at JVH. He is planning to attend Stevenson University in the fall and to major in History. At home, Brady has a 3 year old German Shorthaired Pointer, Daisy. 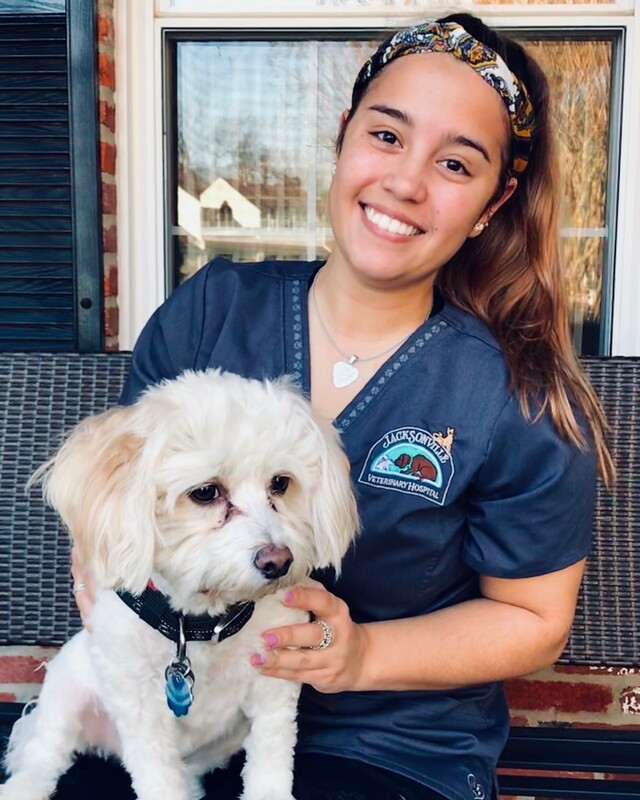 Grace joined our animal care staff in August 2018, and will be graduating from Dulaney high School in Spring of 2019. She loves playing with all of the animals in our pet hotel after a long, stressful day. Grace has 3 dogs and 3 cats, and enjoys working at the barn on weekends. She also enjoys writing, photography, drawing, makeup and fashion, and horseback riding. Grace plans to attend college in the future and major in either nursing or journalism. O'Rane is a familiar face here at Jacksonville boarding. He graduated from Towson University in 2009 and is currently studying to be a K9 trainer. O loves learning about different breeds of dogs and their behavioral traits. He spends time getting to know each animal during their stay and working to ensure their comfort. At home, he has 2 dogs, Athena, a 5 year old French Bulldog mix, and Ares, a 3 month old Cane Corso mix. He also has a cat named Mel Gibson. In his free time, O enjoys drawing, playing soccer, reading, hiking, and pranking his coworkers. Steven began as a volunteer helping around the building from a young age, and started as a member of our Animal Care team in 2013. He is currently majoring in Health at Harford Community College and enjoys learning about all of the various dog species that come into our pet hotel to vacation with us. Outside of work and his college courses, he enjoys spending time with friends, family, pets, and playing bass guitar. Pictured with Steven is his 5 month old Pit Bull mix, Orlaith. Izzy is currently a double major in animal biology and animal behavior at Towson University. After she graduates in 2012, she wants to go to veterinary school and study abroad in Asia and Africa. She is involved in many clubs, including the pre-vet club, womens' basketball, Delta Phi Epsilon sorority, and the Spanish National Honor Society. Izzy loves working with the animals and values the experience she gains from all of our friendly veterinarians. At home, she has 3 cats- Romeo, Juliet, and Milo, and a Multipoo named Spencer. She enjoys arts and crafts, hiking, spending time with family and friends, playing with animals and horseback riding.